All thymes are easy to grow - they like sunshine and a well-drained soil - and most benefit from having their faded flowers trimmed off (but it's not essential). Some are flat, creeping plants, others more upright and bushy. Their foliage can be dark green or brightest yellow and even a combination of the two on the same plant. Most of them have a distinctive, pungent aroma if the leaves are crushed (some are used as herbs after all) and some are just so pungent, you wouldn't want to eat them! 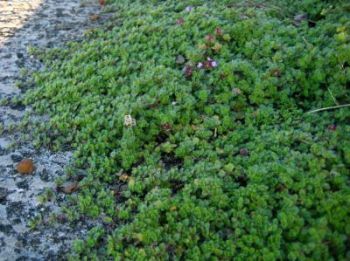 Many thymes are carpet-forming plants forming wide mats of tiny leaves that will follow the contours of the ground, mould themselves over rocks and drape over walls giving a very natural effect. They come in colours from white, through pink to red and are all summer-flowering. Some flower so profusely, they really are a carpet of colour. Bright foliage plants abound within the thymes too - Thymus 'Bertram Anderson' is one of the brightest, most golden-yellow alpines available and will generally stay bright all year round, like all the variegated thymes. Extra interest and extra value.